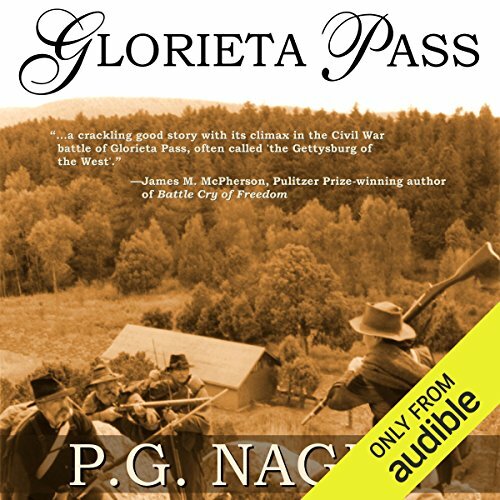 The American Civil War, a devastating conflict that claimed over 600,000 lives and raged for over four years, is the setting for this historical war novel by P. G. Nagle. Nagle follows Jamie Russel, a young Texas officer who has found himself captured by Union forces. Performed by Jeremy Arthur, Glorieta Pass in an exciting look at the everyday lives of the Americans who fought in our nation's deadliest war. Arthur does a good job of relating the truly gruesome and heart-wrenching moments of violence that consume the soldier even in the midst of combat. Young quartermaster Jamie Russell, wounded and taken prisoner by Union forces, soon devises a way to bring the guns to Texas. He escapes, convinces Sibley's brain trust to try his desperate scheme, and his plan becomes grim reality as both the Blue and the Gray are inexorably drawn into the deadly drama that is the Civil War. ©1999 P. G. Nagle (P)2013 Audible, Inc. So good. Poignant and memorable Characters. Hard to be for just one side. Great characters of the North and South. Realistic events described so vividly.